When you don't need a large home for rent in Paso Robles, consider a tucked away apartment instead. 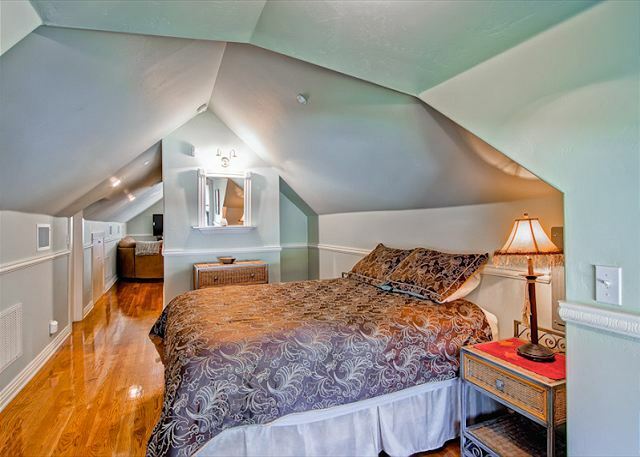 Huston's Attic is a remodeled upstairs apartment with separate entrance, above the Historic Huston House, built in 1894. Located in the heart of the Historic Vine Street district of Paso Robles, just a brief walk down the street will expose you to many historic structures from the early days. It is just one block from the scenic downtown of Paso Robles where you can enjoy dining, entertainment and unique shopping boutiques, or just a quiet walk through the park. You can pick up some fresh local farm goods and items from the Farmers Market in the park on Saturday mornings and Tuesday afternoons. 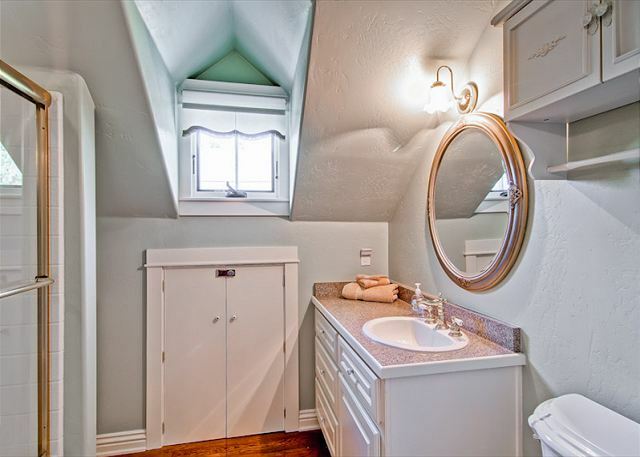 This property is a one bedroom/one bath master suite with a walk-in closet and queen-size bed. It has living room with TV and is set up for internet service. 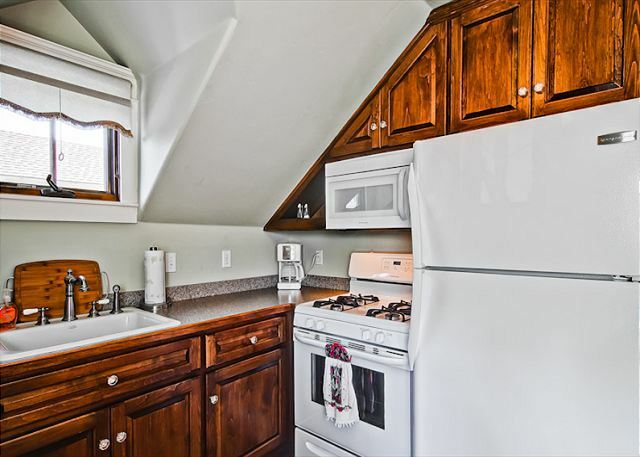 There is a nice little kitchen area with new appliances, and a stacked washer & dryer in the apartment. We have supplied it with extra bedding and cooking needs for extended stays. 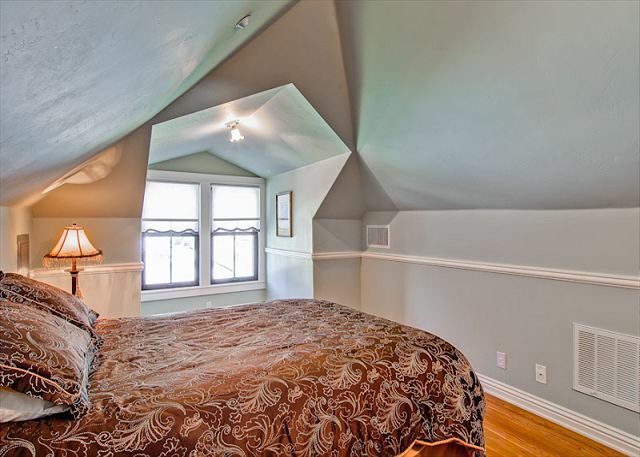 Beautiful and comfortable in an exquisite downtown location. Paso Robles Vacation Rentals® is your local expert! Please contact us with questions about restaurants, wineries and fun things to do on the central coast! Best secret in Paso Robles! Huston's Attic was the perfect location and size for us. It was so nice coming home from wine tastings and having our own home to live in. Not having to drive the car to dinner made the location even better. We loved being able to walk anywhere we needed to go. It was our first time to Paso and we became huge fans of the town, the wine and Huston's Attic. We look forward to coming back soon. 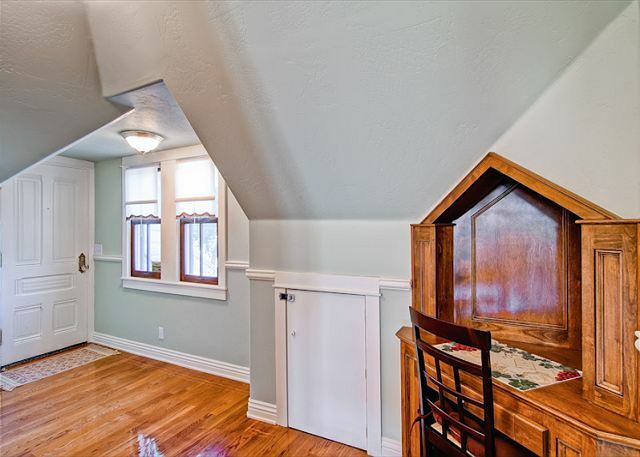 Huston's Attic provided a quiet, convenient and upgraded accommodation for my wife and me. Downtown. Fun in paseo !! Close to all resturantes ! Comfy. Warm easy ! 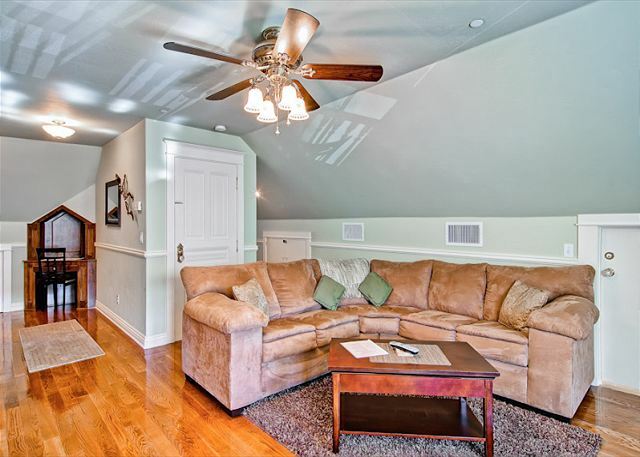 Location great -- close to downtown. Immaculate, charming details, comfortable, safe. Huston’s Attic is a gem of understated elegance. I feel so fortunate to have found it! This upscale, charming renovation radiates with the greatest attention to detail making it a wonderfully cozy, bright and cheerful and inviting place to enjoy. During my months here, I found it to be an ideal “home” and in a great location for walks to town and the nearby hills. Close to everything. Even the views are spectacular, a great spot to watch Paso’s ever-changing orange and purple hued skies. The owners are a delightful couple whose sense of style and design, craftsmanship and care are well reflected in this historic property. As I told my friends back home, “I love being here.” They could tell. We enjoyed our stay at Huston's attic! It was within 2 blocks of downtown Paso, which was great. The place was immaculate and very cozy place to stay. The in unit kitchen was nice too.